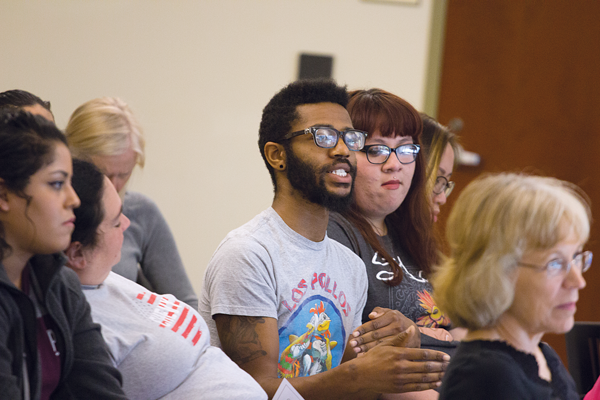 Working artists must be flexible and embrace modern marketing to find commercial success, said participants in the April 4 Making Art Work: Dispelling the Myth of the Starving Artist panel discussion. Will Heron shows his prints to Jasmine Hernandez. Photo by David Sanchez. Shamsy Roomiani, a muralist, printmaker and installation artist said it is always a good idea to network on social media. Roomiani also recommended that artists work with mediums they may not be comfortable in if they want to grow and be successful. Artists Brennen Bechtol, Andrea Tosten and Will Heron also served on the panel, part of the monthlong Literary & Fine Arts Festival. Heron, a muralist and printmaker, is an art teacher at a West Dallas charter school and owner of local gallery The Platform. His ongoing exhibition “Entendre” will remain in the H Gallery until May 1. Heron said being an artist is nothing like a regular 9-to-5, sit-down job. Heron recommended a book by Twyla Tharp called “The Creative Habit,” which advises upcoming artists on creating their own space in the world to help them distinguish a unique taste in art. Bechtol, a freelance sign painter from Oak Cliff and husband of art professor and gallery director Iris Bechtol, said the skills he learned out in the field helped him gain the recognition he has today. Tosten, a calligrapher and bookbinder, said she sets high standards for herself and that others should do the same. Students attend the Making Art Work panel. Photo by David Sanchez. Heron said it’s best to surround yourself with those who will support you and appreciate the work you do. Every panelist stressed the importance of enjoying what you are doing.